Flicker Alley restores Cinerama travelogue spectacles The Golden Head and Flying Clipper. For several years, Flicker Alley's Cinerama project has done a remarkable job of restoring lost and decaying cultural artifacts of the '50s and early '60s that played in a huge three-screen process called Cinerama, which might be described as the immersive IMAX of its day. Shot with a cumbersome three-camera system (later streamlined to a single camera with three lenses) and shown with an equally cumbersome three-projector system (later also streamlined), the Cinerama spectacles were travelogues that became some of the era's top moneymakers. In the waning days of the fad, Cinerama theaters began playing films shot in the more economical 70mm process, and two of the most obscure items of this era have now been rediscovered and polished to a 4K digital shine for our viewing pleasure and curiosity. These are The Golden Head, which had an eight-week run in London in 1965, and the movie that replaced it, Flying Clipper. The package accurately describes The Golden Head as a mystery in the mold of Emil and the Detectives. That 1929 German children's novel by Erich Kästner had just been filmed by Disney and was hit in 1964. The Golden Head resembles it and other Disney movies about enterprising children who must foil bumbling adult criminals because the parents and other grown-up authorities don't take the children seriously. In time-honored Disney fashion, the bad guys are a duo consisting of the smart one and the comic-relief slob, played respectively by George Sanders and Buddy Hackett. They're an odd couple indeed, one patrician and supercilious and the other thick as a brick. The latter makes a few horny remarks about his deprivation of women in order to establish that there's no funny business going on between them as they travel the world and share hotel rooms and trailers. The Golden Head takes place in a world where children wander freely without adult supervision. Perhaps this world existed more in books and films than in reality, but it still seems strange that little Milly (Lorraine Power) sashays about in a foreign country without her siblings or guardians, relying on random people who might speak English and getting into conversations with kindly priests and dapper strangers. Since one of these strangers turns out to be wicked international thief Basil Palmer (Sanders), and he uses her top-secret information about the location of a priceless religious artifact to steal it and claim the girl must be making things up, perhaps the story really is teaching a lesson about the danger of lone children talking to strangers. On Milly's side is her older brother (Jess Conrad, who sings a song) and middle brother (Denis Gilmore) and the older brother's Hungarian girlfriend (Cecilia Esztergalyos). The dad (Douglas Wilmer) is a British police detective attending a conference in Budapest and hasn't got time to pay attention to his kids' crazy stories that turn out to be true. The narrative arc is painfully simple, only becoming a little complicated at the end when events are maneuvered into exactly the kind of frantic and picturesque chase that also marked many a Disney picture. However, this movie isn't really about its story. While Fritz Lang once declared that Cinemascope was best fit for snakes and funerals, it seems that Cinerama was thought best for travelogues, and the story is a thinly disguised commercial sponsored by Hungary's equivalent of the Tourist Bureau or Chamber of Commerce. Long patches of film involve wandering about in gorgeously shot tourist meccas in small towns along the Danube and in Budapest. The plot stops cold for a wedding celebration enacted by the Hungarian Folk Dancers in full regalia, slapping their boots and twirling like mad. This section of the film features, hands down, the story's most unusual and jaw-dropping spectacle: George Sanders dancing! He's all smiles as he waves his arms above his head and bounces to the rhythm, looking for all the world as if he's actually enjoying himself. Later, we pay a gratuitous visit to the Hungarian Opera Ballet for a snippet of Swan Lake. Even the climactic chase is conceived to show off the best of Budapest. On that level, the picture looks fabulous. A highly unusual co-production between the US, Britain, and Hungary, this comes across as a calculated attempt to raise or at least ripple the Iron Curtain, which is referred to ironically in the opening scene. Everything looks very postcard-ready and capitalist-friendly. According to one online researcher, this project originated as an MGM co-production for Hayley Mills to be directed by James Hill, but things changed and, in the end, The Golden Head wasn't released in the US. The Golden Head seems an unusual assignment for prolific MGM director Richard Thorpe. Although he did all kinds of pictures, his biggest films tended to be robust adventures. Strangely, this point in his career found him, while pushing 70, helming a series of youthful diversions. The previous year, he'd done Follow the Boys (1963) and Fun in Acapulco (1963). In 1965 he directed Hayley Mills in The Truth About Spring (so he worked with her after all), and that same year saw That Funny Feeling with Sandra Dee and Bobby Darin. He retired in 1967, so maybe all this fluff was getting him down, or maybe he just wanted to live his 70s in peace. He died five years short of 100. 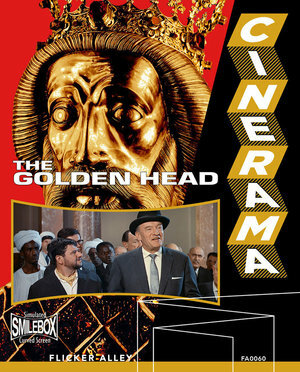 The movie that replaced The Golden Head at London's Cinerama theatre was strictly a travelogue, and one that had already been playing in Germany. 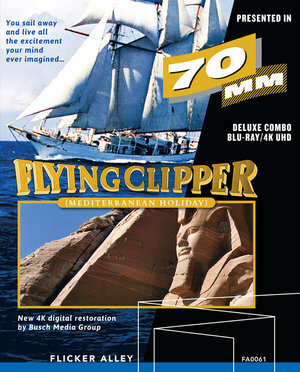 Flying Clipper (1962) uses its titular Swedish Merchant Marine ship, a three-masted schooner with its captain and crew of 20 teen cadets, as the loose excuse to travel around the Mediterranean. 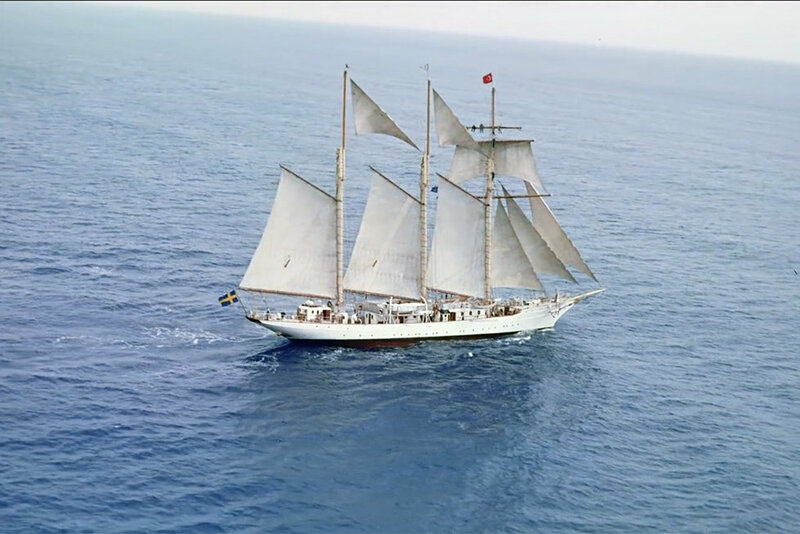 In this respect, it resembles Windjammer: The Voyage of the Christian Radich, the 1958 Cinerama film (actually a modified process called Cinemiracle) that used a Norwegian training ship to sail around the Atlantic. The resemblance is no coincidence. As explained in a highly informative bonus on this DVD/Blu-ray combo, German producer Rudolf Travnicek conceived this project as a sequel to be called Windjammer 2 but wasn't allowed to piggy-back on that. So the German production became Flying Clipper with the subtitle "Traumreise unter weissen Segeln" ("dream voyage under white sails"). Cinerama distributed the picture in the US as Mediterranean Holiday, which still sounds like a Cinerama sequel. Travnicek's canniest idea was to shoot in 70mm, the process that essentially replaced the difficult Cinerama, so that it could play in more theaters. However, only two American companies made and rented 70mm cameras, and that was at a prohibitive expense, so Travnicek commissioned Danish camera constructor Jan Jacobsen to build a brand-new 70mm camera, the MCS-70, just for this film. The new camera had the advantage of being much smaller and lighter than the bulky American cameras, so it could easily be affixed to the bottom of light aircraft and the front of cars. According to the interview with camerman and distributor Jürgen Brückner, this type of camera (also called Superpanorama 70) was used for John Frankenheimer's Grand Prix (1966) and the aerial shots in Robert Wise's The Sound of Music (1965), among other films, so its development for this German film proved crucial. He also states that only six MCS-70 cameras were made; he owns one and two went to NASA. Enough technical history. Flying Clipper is a beautiful tourist movie marked by high-flying camera work, gorgeous colors, and a lush, glorious, diverse, tuneful and rousing score by Riz Ortolani from his most fertile period. Like the Mediterranean Sea, the film bridges ancient and modern, and East and West, as the ship travels from Portugal to Egypt, Beirut ("the Paris of the Middle East" -- those were the days), Yugoslavia, Athens, Istanbul, Naples, Monte Carlo and Seville, with other ports along the way. Typical tourist postcards are here: the Nile, the pyramids, the Sphinx (upstaged by a belly-dancer), King Tut's sarcophagus in Cairo, the cedars of Lebanon, the Acropolis, the Hagia Sophia, the Anatolian mountains, etc. We see all kinds of folk dances and parade marches for local quaintness. We glimpse Princess Grace of Monaco (the artist formerly known as Grace Kelly) and Prince Rainier before the camera is strapped onto a car that's not exactly racing in the Grand Prix but gives that impression. Dropping by to chat with the sailors are Begum Aga Khan (who had been Miss France of 1930) and Greece's Prince Constantine, who would shortly become his country's final monarch. We witness bullfights and camel fights, and we see the sailors ride all kinds of things: motorcycles, horse-buggies, go-karts, donkeys. Somehow the sailor boys are always hanging out with pretty local girls. We get an interlude with a scene-stealing chimpanzee (look, he wears clothes and drinks coffee! ), but by the end of the film, the narrative has almost completely forgotten that there are supposed to be sailors around. The most curious detour is when the (fabricated?) drama of a young sailor's appendicitis gets him airlifted to an American aircraft carrier patrolling the sea, the U.S.S. Shangri-La, for an extended tour of duty with much footage of military hardware. Apart from having obviously solicited and received the cooperation of the U.S. Navy, this section of the film seems included to remind viewers of NATO's political reality in an area encompassing the Iron Curtain, the Suez Canal, the decadent West, and Franco's Spain. The message is that Europeans can enjoy the sea and sun because friendly America is on the job. It sounds like Travnicek knew how to hustle for production value. Viewers receive the impression of a world both large and small, familiar and strange, historical and contemporary, glamorous and diverse, somehow all laid out as a smorgasbord of gracious living for those who can afford it, or at least for sailors. At its best, it's majestic and dizzying and must be more so on a huge screen as intended. Amid the disc's multiple soundtrack and subtitle options, the most important choices are the original German or American tracks. The primary difference between them is the narration. The English version has more narration, often different in tone and information from the German, and is delivered by Burl Ives. He functions as an entertainer who offers rhymes and his own songs, at one point replacing an English sea chanty heard in the German version. If you choose to watch the German version with subtitles, you get a transcription of Ives, not a translation of the German track. If you can follow German, you get something just as interesting that lets more of the film speak for itself; the narrator is Hans Clarin. Bonus interviews focus on the fascinating production history of the film and the 2017 restoration process of both image and audio. This 4K disc is a German product from Busch Media Group that's been licensed in the US by Flicker Alley, as opposed to one of its own restoration projects, and it's a smart acquisition. As for the DVD/Blu-ray combo of The Golden Head, its main extras are two restored 70mm shorts. Fortress of Peace (1965) is Swiss Army propaganda that shows how they're prepared against invasion by performing maneuvers that destroy trees and knock down mountains. John Hubley's A Tale of Old Whiff (1960), about a detective (voiced by Bert Lahr) and a dog, is an animated film that hadn't been seen in decades and had badly deteriorated, as shown in a restoration demo.